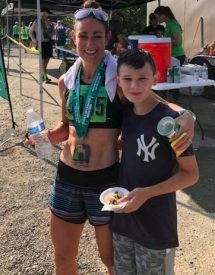 Stroke survivor Tia Accetta, 42, won the Jack & Jill Marathon on Sunday, July 29th in a time of 2:55:49, a new course record. In her first marathon since suffering a cerebellum stroke after a long run in April, 2015, Accetta chose the low-key trail marathon in the Cascade Mountains as a test run. The Jack & Jill Marathon (http://jackjillmarathon.com/) is a largely downhill marathon along the John Wayne dirt trail in the rugged Cascade Mountains east of Seattle. A unique feature of the Jack & Jill Marathon is the 2.5 mile train tunnel at the start of the race. Running in the pitch dark with a headlamp, Accetta was in third place coming out of the Snoqalmie Tunnel in the Sunday marathon. The cause of her stroke is still unknown, though it is suspected that she suffered a dissection of the vertebral artery, one of the four main arteries to the brain, exposing the membrane that is prone to forming blood clots. Accetta’s recovery treatment was overseen by Dr. David Teeple, the Director of the Stroke Care Program at Tucson Medical Center. With a marathon PR of 2:48:05, Accetta had harbored the dream of qualifying for the Women’s Olympic Marathon Trials before the stroke. The subject of a 2015 Runner’s World article (https://www.runnersworld.com/news/a20853384/after-stroke-olympic-trials-hopeful-ponders-running-future), Accetta is hoping to run the California International Marathon in December 2018. The mother of two young children, Accetta is an RRCA certified running coach who coaches athletes online and in Tucson, Arizona. About Run Tucson: Run Tucson (www.runtucson.net) is a full service event and coaching entity producing running events in partnership with the Southern Arizona Roadrunners (www.azroadrunners.org). With coaches certified by the Road Runners Club of America (www.rrca.org), Run Tucson manages Arizona’s longest-running coached training group, the Workout Group.